A slight tan to the page edges. Good condition book. Good condition is defined as: a copy that has been read but remains in clean condition. All of the pages are intact and the cover is intact and the spine may show signs of wear. The book may have minor markings which are not specifically mentioned. Most items will be dispatched the same or the next working day. Fair. Dispatched, from the UK, within 48 hours of ordering. The book is perfectly readable and fit for use, although it shows signs of previous ownership. The spine is likely creased and the cover scuffed or slightly torn. Textbooks will typically have an amount of underlining and/or highlighting, as well as notes. If this book is over 5 years old, then please expect the pages to be yellowing or to have age spots. Damaged book. Slightly damaged in some way typically, a grazed corner or torn cover. Aged book. Tanned pages and age spots, however, this will not interfere with reading. Geldart, William, and Geldhart, William. Very Good. 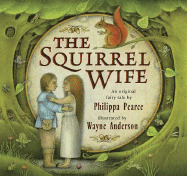 The Squirrel Wife (Young Puffin Story Books S. ) by Pearce, Philippa, 1992-02-27. B-format paperback. 64 p. Young Puffin Story Books S. . B&w illustrations. Intended for a juvenile audience. Anderson, Wayne. Very Good. 32 p. Chiefly col. Illustrations. Intended for a juvenile audience. When Jack helps one of the green people, the fairy king rewards him with a "squirrel wife". The couple are happy until Jack's jealous brother turns the villagers against him and, they lock him up. The king of the green people tells Jack his squirrel wife can free him, but to do so she must give up her knowledge of the forest and all its secrets.